In an effort to improve quality and contain the growing cost of health care, states are increasingly undertaking a shift away from fee-for-service reimbursement models that reward quantity of services and moving toward alternative payment models that reward value. Many of the states leading the way in payment and delivery system reform have received State Innovation Model (SIM) awards from the Center for Medicare & Medicaid Innovation (CMMI) that have aided in accelerating that work. In a new issue brief, SHADAC senior research fellow Colin Planalp profiles the innovative work in Ohio to link the state’s payment and delivery system reforms with another important policy priority: interventions to curtail the opioid crisis. 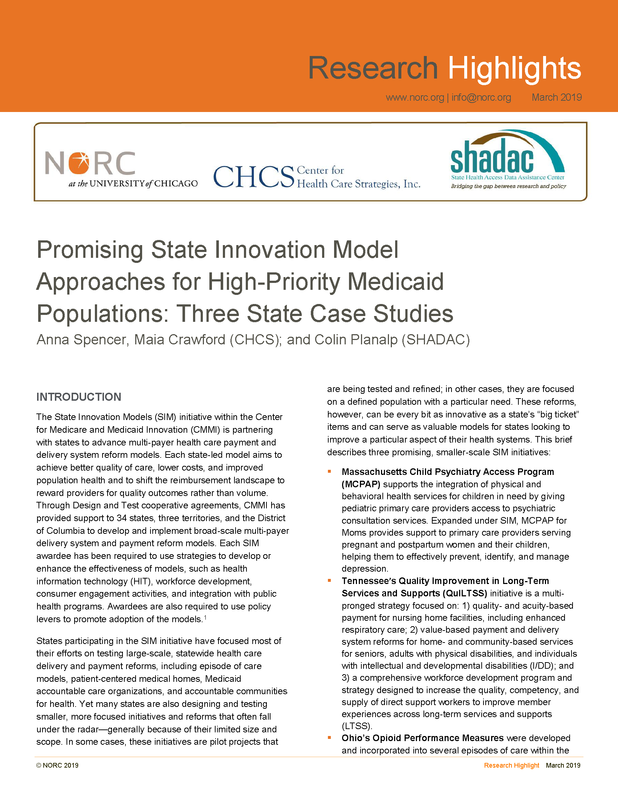 This paper was produced collaboratively by SHADAC and the Center for Health Care Strategies (CHCS) with support from the Center for Medicare & Medicaid Innovation (CMMI). SHADAC and CHCS are part of a team led by NORC at the University of Chicago that serves as the SIM Resource Support Contractor. SHADAC and other technical assistance partners support states and the Innovation Center in designing and testing multi-payer health system transformation approaches. In 2014, Ohio became one of seventeen states to receive a SIM test award from CMMI in order to implement payment and delivery system reforms aimed at controlling the cost and enhancing the quality of health care. Acting as laboratories of innovation, each state employed a unique strategy tailored to their specific situation. One of the key components of Ohio’s SIM was developing “episodes of care” as an alternative to fee-for-service payments for some types of discrete health care conditions such as an appendectomy, colonoscopy, or treatment of an ankle sprain. Under the episodes of care payment model, participating Ohio providers are eligible for incentive payments if they meet targets for both cost containment and quality performance. During the payment model development process, staff from the Ohio SIM team recognized that many of the state’s planned episodes focused on procedures such as spine and joint surgery, which they knew were associated with prescription opioid painkillers—a topic of particular concern in Ohio, which has some of the highest rates of opioid overdoses in the U.S.
Based on that realization, the state analyzed its Medicaid claims data and identified potential episodes that represented a large share of opioid prescribing. Afterward, they worked with a consultant and stakeholders to develop evidence-based quality measures for appropriate opioid prescribing. The state then built those quality measures of appropriate opioid prescribing into approximately a dozen episodes of care—such as dental tooth extractions and treatment of lower back pain—as part of a two-pronged strategy: 1) by giving health care providers information on their performance for opioid prescribing quality measures compared to benchmarks; and 2) by using their performance to influence their eligibility for incentive payments, the state aims to leverage its payment reform efforts to reduce inappropriate prescribing of opioids and ultimately mitigate the opioid overdose crisis. For more information on Ohio’s SIM work to improve opioid prescribing and examples of SIM projects in other states, read the issue brief on CHCS's State Innovation Model Resources Page.